The need: The original research by Dairy Australia’s InCalf program found that much of the variation in reproductive efficiency between farms was due to herd management issues. Devising ways for large numbers of farmers to make relevant changes to their herd management would therefore improve the fertility of the national dairy herd. 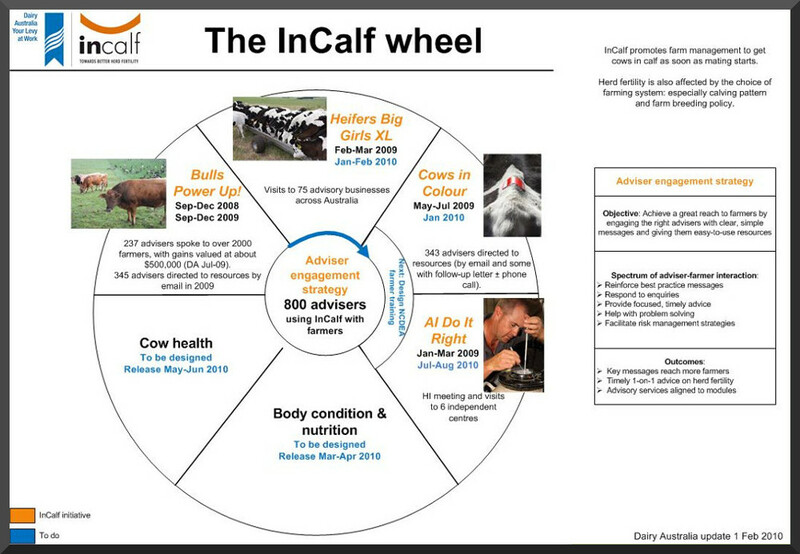 What we did: The Harris Park Group led the fourth funding cycle of InCalf, with Dr Barry Zimmermann as Project Leader. We designed a series of national campaigns to provide content that was simple but effective for core reproductive management areas, namely: bulls, heifers, heat detection, AI and transition cow management. Our aim was to engage the relevant advisers in the modules so that farmers get timely InCalf messages through interactions with their service providers (veterinarians, nutritionists, herd improvement organizations, AI technicians, etc). The modules were designed to be run annually, leading to cumulative practice change on farms.